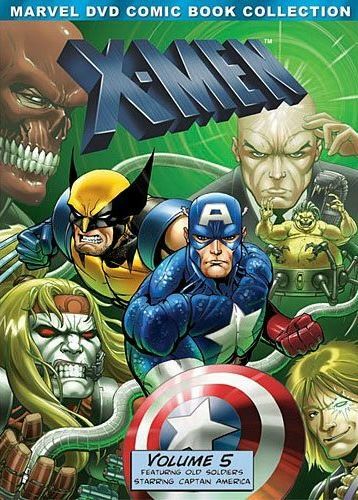 The final X-Men episodes are finally here on DVD! And the cover art for it is pretty cool. Got Captain America and Wolverine front and center looking fierce, surrouded by Omega Red, Red Skull, and Mojo, and Professor Xavior in the back looking like he's about to blow someone's mind à la Scanners style. Oh, and then there's some pretty boy named Longshot down in the corner. The art in the actual series isn't nearly as good as what's seen on the cover, but it's still pretty decent. As I was watching through the episodes, I noticed that the one titled No Mutant is an Island was way out of place. In it, everyone is sad because Jean Gray supposedly died, and Cyclops anger and despair over it cause him to walk away from the X-Men... except that we just saw Jean Gray alive and well in the previous episodes. So this episode was obviously out of order, and I'm not sure why they released it with this series instead of in the previous release, but I'm also really not sure why they stuck it in the middle of the disc instead of like the first episode on the disc or even the last, with just a little note beforehand explaining that the episode did not belong to this season. Doing a bit of research online led me to find that the episode is actually part of season 3, along with a couple other episodes. And like all the other releases, this one also doesn't have any special features, meaning there's no featurette or even a piece of text that tells about what's going on with the out of place episodes. So my online research tells me that apparently the episodes on DVD are ordered according to air date. It would have been so easy to have a special feature to explain this, even if it's just a screen or two of text. I was really hoping that this final volume would get some kind of special feature telling us something about the show, but no luck. I mentioned in my review of the Iron Man animated series that it was full of stuff that didn't make any sense at all. At least the first season was. The second was much better at trying to make sense, and these episodes are similar. They do try, but there are times when there's just no escaping the messed up logic. Such as A Deal with the Devil, when the government awakens a major bad guy Omega Red to have him go down to an abandoned submerged Russian submarine because he's the only one that knows the codes to get it operational and because he is the only person who can withstand the radiation without dying. He agrees to do this on the condition that he can choose two X-Men to accompany him... but if they could go down there and survive, then there is no need for Omega Red to go down there. Just have them go down and have Omega give them the codes. Of course, then there'd be no real story. Anyway, despite the occassional logic errors and animation mistakes, this is still a fun series to watch just as long as you don't take it too seriously. The characters show real emotions and depth and you do tend to care what happens to them. The Marvel universe is a huge one, and it's nice to see other characters show up and interact with our main group. If you own the previous volumes then you already know you'll be getting this one. And if you haven't seen any of them yet, go back and start at the beginning, and you'll probably wind up watching this one eventually.